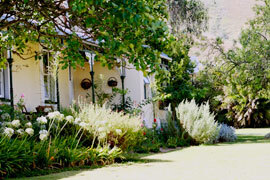 Accommodation in Robertson: Almondbury Guest Farm. You are here: Home / Western Cape / Robertson / Accommodation in Robertson: Almondbury Guest Farm. Want to get away from it all, well look no further – Almondbury Guest Farm offers you a relaxing getaway. Almondbury Guest Farm is situated just 6km outside the town Robertson, an attractive town with its quaint buildings with roses and Jacaranda lined streets. Country comfort in the shadow of the majestic Langeberg Mountains. Scenic surroundings and cozy accommodation in a historic Victorian Guesthouse close to nature. The Lodge overlooks a vineyard opposite the river and views of the surrounding mountains, there is also a dam at the foot of the garden where you can observe a variety of birds and other wild life species. You can book the entire Lodge on a self catering basis or you book a double, single or family room with dinner and breakfast options. The Lodge consists of 6 bedrooms, 5 doubles and 1 twin rooms, all double rooms en-suite accommodating in total 16 people sharing; it also has a communal lounge with TV, large kitchen, dining area and fireplace – braai area outside. Our swimming facilities are ideal for the adventurer, both cement dams are rather deep but great for swimming in the warm summer days. We do not recommended children to swim without the supervision of parents. Wi Fi facilities available for guests staying at the lodge at no cost. Breakfast and dinner can be booked on request. Almondbury Guest Farm offers an intimate setting for small weddings (up to 40 people in house) and up to 80 people outside on the lawn (open air or tent). The packages we offer are tailored for each couple and ranges form an all inclusive package – wedding venue – wedding car – wedding photographer – full catering – wedding cake – accommodation for 10 of your guests (5 double en suite rooms). The garden is a perfect setting for all your wedding pictures. Almondbury has a relaxed atmosphere and offers the old farm feeling, rustic and basic and we strive to keep all our weddings simple but unique. Hiking trails, cycling, bird watching and waterfalls which are on our doorstep (Dassieshoek Nature Reserve 3km). There is also a 18 hole golf course +- 6km from the farm Silwerstrand Golf Course – and of course, the numerous wine estates on Route 62 and Robertson Wine Valley attracts many people to this area.